Genuine Brand New Air Lift 3P 1/4? Management + Front & Rear Slam Series Kit. 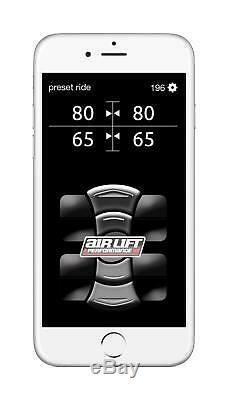 Airlift introduces the worlds first Height and Pressure based Air Suspension control system! Starting out with the 3P Pressure system you may add level sensors at any time and it becomes a 3H system! 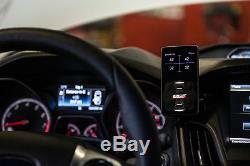 Control is done via the dedicated iPhone / Android Smartphone APP. All achieved via Bluetooth as well as the amazing wired hand controller you can switch seamlessly from Pressure Based controls to Height Controls when when height sensors are added. (See 3P to 3H Height Sensor Upgrades/3H Kits in the shop). 3P/3H Controller Display & 1/4? APP FOR IOS OR ANDROID. Self Purge Self Drain Water Trap. 4 Gallon 5 Port Aluminum Tank. All wiring, fuses, hardware, etc. All required tank fittings for installation. Powdercoated gloss black steel brackets. Custom double bellows air springs. Modifications Required: Requires cutting 15mm off rear upper coil spring locator and a Chassis notch to the front. Get your Golf MK5 down! With almost 6 of drop, 5.8? On the front end and 5.8? On the rear, plus all the versatility of air, the Air Lift Performance Slam kit is the best choice for show stance AND daily driving. Get the looks you crave with the performance you need! Front Slam Kit Fits MKV-MKVI Platform: 05-14 Audi A3, 07-14 Audi MKII TT & TT RS Quattro AWD (55mm front struts only), 06-14 VW Golf, 06-14 VW GTI, 05-14 VW Jetta, 06-14 VW Rabbit, 06-16 VW Passat, 09-16 VW CC, 07-14 VW Eos, 11-14 VW Golf R AWD, 11-14 VW Jetta VI GLI (does not fit Jetta S) - Front Slam Kit. Rear Slam Kit Fits MKV-MKVI Platform: 05-14 Audi A3, 07-14 Audi MKII TT (55mm front struts only), 06-14 VW Golf, 06-14 VW GTI, 05-14 VW Jetta, 06-14 VW Rabbit, 06-16 VW Passat, 09-16 VW CC, 07-14 VW Eos, 11-14 VW Jetta VI GLI (does not fit MKVI Twistbeam) - Rear Slam Kit w/o shocks. Explained when height sensors are added. The difference between 3P and 3H is simple, 3H comes with height sensors and 3P doesn't, but once you add height sensors its a 3H system. See the shop for the 3P to 3H upgrades which includes height sensors & hardware. Or get started with 3P Pressure as above and add them later on. See the shop for more Air Lift Accessories, Air Tanks, Bags, Management, Complete Kits plus 100s more Genuine Performance Parts. Get news of New Parts to your inbox. 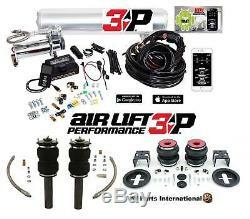 VW Golf MK5 R32 GTI TDI Air Lift 3P 1/4 Air Ride Lowering Suspension Slam Kit. Choosing the right Air Lift Kit. All other Non VW Parts. 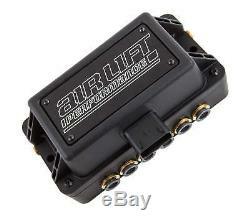 VW Golf MK5 R32 GTI TDI Air Lift 3P 1/4? Air Ride Management + Front & Rear Slam Series Suspension Kit. Please check this listing page carefully as the answer is usually there. Of course it could be cancelled if after the conversation, it turns out not to be a suitable part/product for you. For 1000s more of the best available parts. Made with in Great Britain. Template Managed & Developed by Dev VIP. 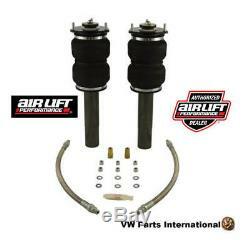 The item "VW Golf MK5 R32 GTI TDI Air Lift 3P 1/4 Air Ride Lowering Suspension Slam Kit" is in sale since Monday, August 1, 2016. This item is in the category "Vehicle Parts & Accessories\Car Tuning & Styling\Performance Suspension\Air & Hydraulic Suspension". The seller is "vw-parts-international" and is located in UK. This item can be shipped worldwide.